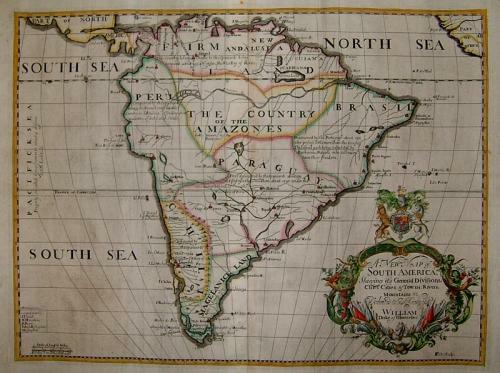 Title: A new map of South America, shewing it's general divisions, chief cities & towns, rivers, mountains...dedicated to his Highness William Duke of Gloucester. (From 'A New Sett of Maps both Of Antient and Present Geography). A bold map of the South American continent that contains notes about discovery. Wells was a mathematician and teacher of geography and his maps were highly regarded at the time for their accuracy. A large English map that is very decorative and is in very good condition with only a slight centerfold and margin toning.